Peter was born in Perth and educated at John XXIII College. He studied Medicine at the University of Western Australia and graduated with Honours in 2004. At UWA he received the Alan Charters Prize and was given the honour of being his graduating class Valedictorian. He is fluent in Italian and French. He undertook his residency at Sir Charles Gairdner Hospital in Perth, and following a period working in the United Kingdom he was selected in 2008 for the Advanced Training Program in Orthopaedic Surgery in Western Australia. 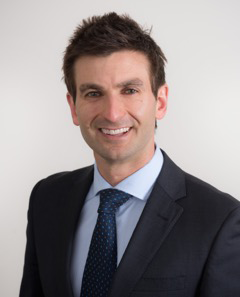 Upon successfully completing his training he became a Fellow of the Royal Australasian College of Surgeons and the Australian Orthopaedic Association, and in 2014 commenced his practice as a Consultant Orthopaedic Surgeon at Fremantle Hospital. Peter has sub-specialised in Shoulder & Knee Reconstruction and Hip Arthroscopy, which coincides with his particular interest in Surgery for Athletes. He was awarded fellowships at three prestigious international training centres that provided the opportunity for highly specialised further training, and he spent more than two years overseas gaining expertise. He was the first surgeon from Perth to be selected for the Chelsea Complex Knee Fellowship in London at the Chelsea & Westminster Hospital and Fortius Clinic. This was followed by training in Shoulder Surgery and Trauma at the Royal Free London and the Hospital of St John & St Elizabeth. He then moved with his family to Vancouver, where he trained in Hip Arthroscopy and Joint Reconstruction at the University of British Columbia. He returns to Perth as one of the few fellowship trained Hip Arthroscopy Surgeons in Western Australia. Peter is committed to the Public Health system, and is a Consultant in Orthopaedic Surgery and Trauma at Fiona Stanley Hospital. He has joined the Coastal Orthopaedic Group for private practice, and is based at Bethesda Hospital in Claremont and St John of God Hospital Murdoch. Having presented extensively and published a number of papers in peer-reviewed journals, Peter possesses a strong belief in evidence-based practice. His ongoing research and teaching commitments include a position as Clinical Senior Lecturer in the School of Surgery at the University of Western Australia. Peter understands athletes. He played Amateur Football for more than 10 years winning one memorable premiership. Following a shoulder injury he moved into coaching and administration and eventually became the Vice President of the West Coast Amateur Football Club and a board member of the WAAFL. He was instrumental in developing the first concussion policy for community football in Australia. He has experience across all levels of sport, including working with elite athletes from the English Premier League, English Cricket and Rugby Union Teams and National Hockey League in North America. He has also worked with high-level swimmers, dancers and martial artists. Peter and his wife Natasha have two young children, Sienna and Josh. He loves nothing more than being a dad, and in his spare time enjoys watching footy with his family, playing golf, snowboarding and enjoying Perth’s great food, wine and local beer.